One of my three classes this quarter is weaving. It has been an enjoyable class so far. 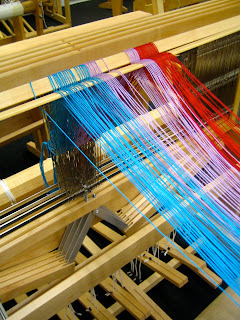 I have learned to make a 3 yard, 120 count warp. I have prepped a four harness loom by threading each warp by hand. And I have experimented with weaving 5/2 cotton, but also unusual pliable materials like drinking straws, wire, and paper towels. While doing some research I came across Suzanne Tick, a weaver and textile designer whose work often makes use of very unexpected materials. She is responsible for most of the textiles produced by KnollTextiles every year. She has an interesting video clip on artbabble where she is weaving a piece made of dry cleaning waste. Check it out! My boyfriend and I were just discussing weaving. He was trying to tell me I could make my own fabric. I had to explain to him that it had to be woven with a loom and that they are expensive! I couldn't afford to stay :( But I still love the school!! 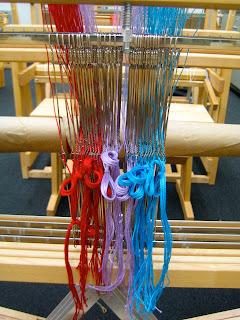 hey pattie, you could always make your own hand loom, it can be as simple as a wooden frame for a canvas or something. wrap your vertical warps around it and weave in between. who knows it could be cool!